Montana Test.com - Results for: Kruger Optical Lynx Tactical Spotter, Mil-Dot Reticle 14-50 x 60! 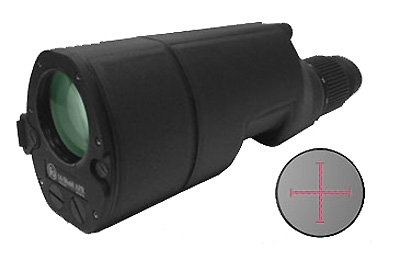 Kruger Optical Lynx Tactical Spotter, Mil-Dot Reticle 14-50 x 60! Lynx Series spotting scopes combine advanced electronics with a user-friendly ergonomic design. Developed by U.S. optical engineers for tactical use, these hand-held scopes are designed for quick and accurate target acquisition. The reticle ranges equally at all powers. A single button controls the brightness of the illuminated reticle, with 10 distinct brightness settings. With the push of a button, the reticle can be removed from the field of view, for a clear view of the target. All scopes are designed with an ambidextrous hand strap and thumb grip for convenient one-handed operation with either hand, as well as a tripod mount on the bottom of the scope. All scopes are shockproof, waterproof and fogproof. Extra-long eye relief makes scopes suitable for use with goggles. All scopes contain superior optical systems, including fully multicoated lenses and an internal BaK-4 prismatic focus system. FOV at 1000yds: 120 ft - 52 ft.